Keiko Furukura is 36-years-old, and has worked in the same Tokyo-based Hiiromachi Station Smile Mart since she was 18. This makes her an anomaly and a social outcast. While her contemporaries have long since moved into corporate jobs and started families, Keiko has become strangely attached — assimilated, almost — to the shop and its needs, and finds solace in its sameness, and the monotony of her function as one of its workers. Keiki is not attuned to the rules that govern regular social interactions, completely oblivious to societal norms most take for granted, so replicates the mannerisms and speech patterns of her colleagues. Keiko accepts her outsider status — it’s not a choice, it’s just who she is — but when confronted by her sister, who worries about her unorthodox lifestyle, Keiko deliberates over her capacity to change in order to adhere to entrenched standards, and in the form of fellow outcast Shiraha, might have a way to attune to normalcy. The question for readers is: should she? 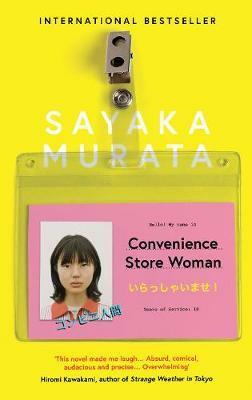 Convenience Store Woman is not a nuanced take-down of societal expectations — don’t worry about finding the subtext, the author’s message is clear — but its brevity, and genuine laugh-out-loud moments make it a joyous one-sitting read. Ginny Tapley Takemori’s translation is delectable, too. I can see this book being a great read for book clubs; in fewer than 200 pages, Sayaka Murata gives readers plenty to marinate over; not just Keiko’s intended conformity, but our own role in how we respond to those who deviate from long-standing presumptions. A book that makes you think, and feel, and laugh; you can’t ask for much more.